The Emancipation Proclamation was anything but the obvious thing to do at the time. It was extremely controversial. Even many northerners were against it. Research into it highlighted questions such as – Did it actually free anyone? Was it even constitutional? It took great courage for Lincoln to advance it. 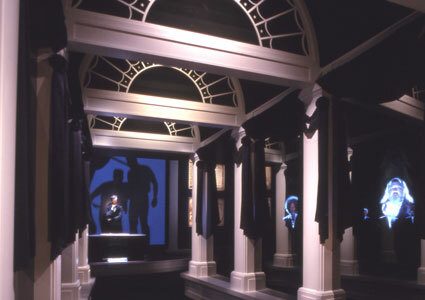 To underscore this, a special-effects, illusion corridor was created featuring a gauntlet of dream-like images. Faces appear ghosted between columns, shouting advice to the president. These were taken from historical writings, and the opinions are often shockingly racist, as well as wide-ranging. At the end of this hallway is seen the figure of Lincoln standing over a table, pen in hand, weighing his options in releasing the Emancipation Proclamation. Arrayed along the walls behind him are a dozen different printed versions as they were eventually presented around the country. Above Lincoln is a shadow play tug-o’-war, these towering shadows argue back and forth over Lincoln, symbolizing the warring conscience of the nation. When visitors see the genuine Emancipation Proclamation in another gallery, its complexity, weight, and huge importance and worth will have a deeper impact. 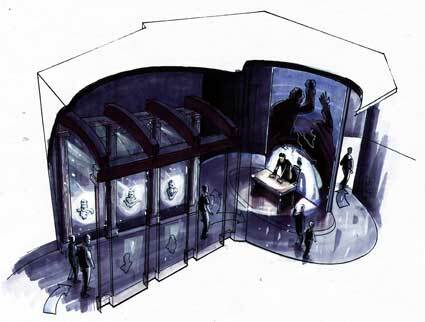 Emancipation Proclamation - Illusion Corridor.